Help! Is my Olfa mat dead? Thread: Help! Is my Olfa mat dead? I left my large Olfa mat in the hot back seat of my car for an hour or so today and when I took it out, it had formed into the shape of the seat and a box on the seat and I can't straighten it out. If I can't get it straight, it's ruined. HELP! Lay it on a flat surface outside, concrete patio or deck is ideal. Weigh down the corners and as it heats up in the sun, it will flatten down. I have successfully done this. It wasn't quite 100% but it wasn't bad. I also put mine on the driveway. It worked. With the heat we've been having here, it could be flat in no time. I laid mine on the deck on a very hot day. I also put a board on top to help flatten it out. It took a few hot days , but it finally got to were I could use it. I guess I did mind it so much since it had that "new " mat smell and was going to spend time outdoors anyway. Here's how many of us carried our mats in Texas, where it often isn't safe even to have them 'flat' in the trunk in the summer. Jan, thanks a great way to even store them between use! I know the Dollar Tree sell those plastic type cardboard posters (? think that is what they are made of) I use it to pin twisters blocks after cutting them to keep there place. Well they sell those boards for $1. each. I'm going to share this with my quilting group! Awesome tip Jan!!! Thank you!!! Thanks, Jan! Great idea! I was about to warn ladies if they lived where I do that the mat might melt if left out too long. It's been Hot! We are getting relief and a little bit of moisture now, but summer is not over! I have heard some will use a hot hair dryer on mats, but for severe problems it might not work. When do you need to place mat in the bath? Would out of shape and water be any use ? Jan, you always do the best pictures to make learning/understanding easy! I don't understand the concept of putting your mat in the bath tub. My tubs aren't wide enough to sit the mat down flat. Do you just prop it up on the side and fill the tub? 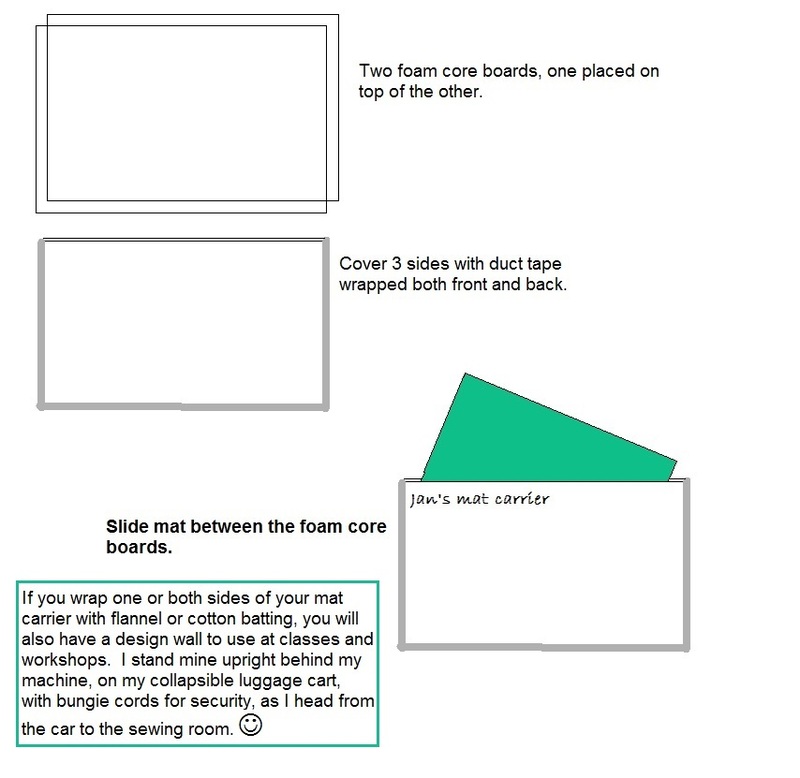 You'll want to put your mat on a hot surface to flatten it. The hottest surface known to man is the roof of a car sitting in the New Mexico sunshine on a hot day . You will probably have to flip it over a time or two but, once it is flexible get it off the car and lay it on a flat surface to cool. Thanks for sharing this great idea, Jan! It's good to see you back here so soon. Hope it doesn't hurt to type! I put mine on the hood of the car. This car had an old paint job, so wasn't worried about that, (not that it did anything to the paint js) I'm in Florida.